This Holiday season of giving, we hope you please consider supporting the boys and girls of Detroit Youth Lacrosse. In our first year, Detroit Youth Lacrosse reached over 150 boys & girls, providing free meals, lacrosse clinics, team practices, scrimmages and even competition in a tournament at which our U12 boys team made it to the championship game! Your support will allow DYL to continue the introduction of Lacrosse to Detroit’s youth, using mentorship and coaching to discover new pathways toward academic success and a college education. Michigan winters are cold and a great way to keep our youth involved, active, and engaged is by offering indoor practices and tutoring sessions. To cover our entire youth winter season we are determined to raise $12,000 which will cover the cost of field time, player scholarships, field trips and coaching stipends. Every little bit counts so please help us spread the word about supporting Detroit Youth Lacrosse. Best wishes to all, and have a safe and restful holiday season! Lacrosse is the oldest sport in the United States, the fastest growing sport, and one of the least integrated sports in this country. Detroit Youth Lacrosse is working to bring the sport to kids here in the city of Detroit, MI. Our mission here at DYL is to cultivate the resiliency of our children and empower them through mentorship and coaching to pursue academic, athletic, and community-centered excellence while fueling the growth of lacrosse amongst children of color, their families and the community at-large. We look to accomplish this goal by fostering relationships with schools, colleges, families, and the individual student-athletes so that they might reach their full potential! For our first summer season, Detroit Youth Lacrosse focused on children ages 7-13, running mandatory team practice sessions 3 days/week (Tue, Thur, Sat) and additional individual clinics 3 days/week (Mon, Wed, Fri) from April to June of 2018. Aside from practice, our players wenton two field trips to watch Division 1 Men’s Lacrosse games at University of Detroit Mercy and the University of Michigan. On July 28th, 2018, Detroit Youth Lacrosse celebrated the end of our first summer season with an 8v8 inner-program tournament! This event allowed our players to compete against each other, showcasing their progress to their parents and the community. 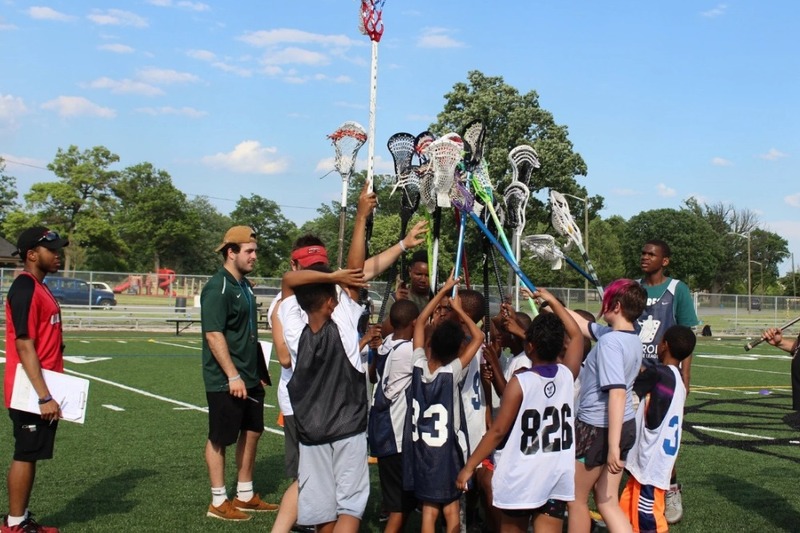 Before, during, and afterwards, there was space for a community-cookout and other fun activities to honoring Detroit Youth Lacrosse's commitment of building community around lacrosse. Detroit Youth Lacrosse is projected to establish 501c3 status in fiscal year 2019. Until DYL has reached official non-profit status, the Chandler Park Conservancy will be acting on Detroit Youth Lacrosse's behalf as a fiduciary, allowing all donations to the DYL program to receive tax-exempt status. Help us reach out goals by donating to Detroit Youth Lacrosse! You can check us out online at www.detroitlacrosse.org for more information or follow us on social media at www.instagram.com/detroityouthlacrosse or www.facebook.com/detroityouthlacrosse. Thanks for partnering with us and for investing in the future of our children!